Browsing the shelves in bookshops, libraries and even the virtual aisles of online retailers is a great way to find new books. Unfortunately, the seemingly unlimited options are often too much for children who just want to find one book and go home. Children aren’t born knowing how to purposefully browse for books, so it’s up to you to discuss this action, be an example and help your child practice as means to teaching children to browse books. Children may be familiar with the word “browse” but if pressed they may explain that it’s “going shopping” or “looking for something”. Explain to them that purposeful browsing means remaining interested in and open to whatever is available, with any parameters they may want. For example, children can purposefully browse in a bookshop by identifying their reading level, or the graphic novels section, or the picture book section. In the library they can locate the children’s book section and displays for their age ranges. When they go online with you, you can both decide on search terms or sections of a website which might help cut down on results. Purposeful browsing is all about narrowing down the options slightly, but still providing diverse options to explore. Many children will grasp the concept of browsing, but may still wonder just how it’s done in real life. 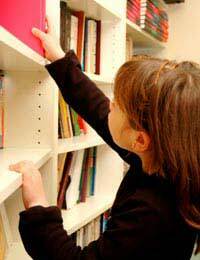 Be a browsing example by taking children to a bookshop or library for a set amount of time and walk them through the steps you take to find a book. Explain as you go, for example saying “Mummy is looking for a new novel, which is a made-up story, so we must go to the fiction section” or “Dad wants to find a book on computers so he knows to go right to the technology section”. Also let them watch you approach bookshop or library staff so that they know it’s acceptable to ask for help or recommendations. Even saying something as simple as “I’m a fan of books by this author, can you recommend any other books I might like?” Will allow children to see just how it’s done so they can copy your actions in the future if they so desire. Once you’ve walked your child through the steps of purposeful browsing, ask him or her what (s)he is interested in reading about and together discuss the steps for how best to browse for this type of book. If (s)he has no idea of a topic, then help him or her remember that they do know their age range or reading level, so that’s the perfect place to start browsing. As your child looks at books, ask him or her simple questions that (s)he can keep in mind for the future. “What attracted you to that book?” “Does the blurb on the back cover make you interested in the story?” “Has anyone told you if that book is good or bad?” These simple questions will help become a framework with which a child can analyse their options and ultimately make a well-informed decision about their reading material. Teaching children to browse books is an important step towards helping them to make independent, but interesting and appropriate, reading choices. Discussing the concept of purposeful browsing, being an example of browsing and helping children practice browsing are all great ways to teach children to better browse books.